Varsity Cleaners offers a wide range of cleaning and alteration services to provide our customers with exactly what they need. Our professional and courteous staff will work within your timeframe to help accommodate your busy schedule so that you can stay focused on the more important things in life. For your covenience, we offer In-House Charge Accounts. Drop off, or let us pick up & deliver, your items anytime throughout the month and have only one payment at the end of each month. Click here to learn more and sign up today! Whether it’s a suit, sweater or dress, we can get the wrinkles out and have you looking sharp for your next big occasion. We also dry clean bedspreads and comforters to keep your bedding looking new and feeling great. We use perchloretheylene, the standard for the industry, for our dry cleaning solvent, and we pre-spot stains when necessary. After cleaning, your garment is pressed on one of 9 pressing stations that are set up to finish a specific kind of garment for better press job. 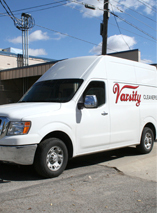 Our free pickup and delivery service visits locations in Waterloo and Cedar Falls, and stretches to the north to Greene, west to Iowa Falls, south to Marshalltown and east to Winthrop. Our drivers have established routes where they pickup on one day and deliver back 2-3 days later. They also pickup call-ins on a daily basis. Orders picked-up in the metro area can be delivered as early as the next day. You can drop off laundry for us to wash, dry and fold (bachelor bundle). 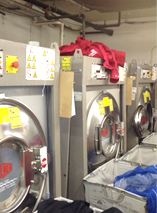 We also have special laundering processes for dress shirts, linens and starched jeans. We can handle anything from cotton/poly blend dress shirts to more delicate pieces of clothing, and you can indicate how starched you would like your clothing to be. Our two full-time seamstresses can help you with that sport coat that needs the back taken in a little bit or the dress that needs to be hemmed up just a shade. They suggest alterations and make measurements as you try on your clothing in our fitting room. They can also perform minor repairs such as replacing zippers, or re-sewing seams and more in clothing you still wish to wear for a while longer. 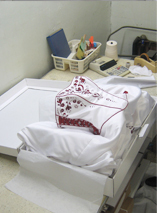 We can clean, press and then preserve your wedding gown or formal dress to create a one of a kind keepsake. 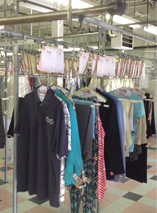 Our staff will pre-spot, wet or dry clean and press your gown and return it to you on a hanger. For the ultimate keepsake, we offer the “Keepsake Wedding Gown Box” that will help prevent your gown from being crushed or damaged, keep the bust shape and prevent yellowing and fabric weakness. Bring us your dusty, dirty grungy drapes and we’ll return them to you looking like new. 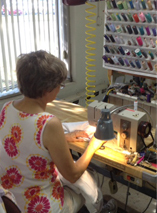 We measure the drapes before we clean them, wash them according to the care label and then flat press them. At this point, most other cleaners would be done, but we go further. We weave the pleats at the top of the drape panel and expand them to their original size before they were brought in for cleaning, ensuring an exact size match and perfectly folded pleats. Our feather pillow cleaning system cleans and sanitizes your feathers, broken feathers and chaff are separated, then your sanitized feathers are blown into a new cotton ticking. At your request, we can add or subtract feathers to be sure your pillow is as firm or soft as you like.